By now we’ve all heard of Reporting Services - Microsofts latest add-on to SQL Server, or should have at any rate, and there seems to be a level of excitement about this new product. The fact that the reporting solutions market really needed a new entrant hasn’t been in any doubt – anyone who has gone through the frustration of using Crystal or worse still having to interface with it, will testify to that. So lets take a first look at Reporting Services a new entrant to this market. 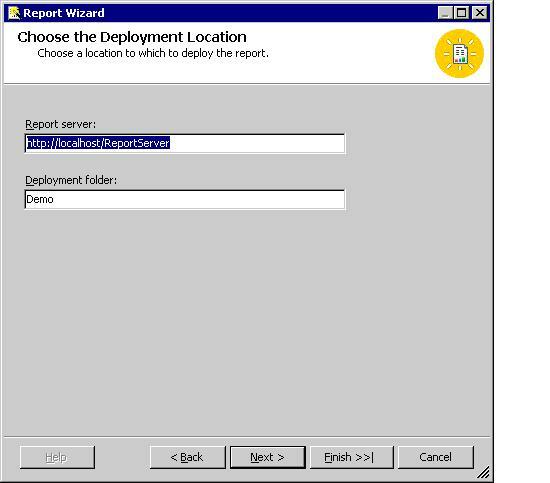 Initially Reporting services was supposed to be released as a part of Yukon, Microsoft decided to release this earlier. The public beta is out, and the release is scheduled for Jan 27th 2004. That’s the first piece of good news, however it gets better, Reporting Services is an add-on to SQL 2000 so we don’t have to shell out money for this. The designer is a part of Visual Studio.NET 2003, and since this is a site primarily targeted towards Microsoft developers – I assume you all have that as well. I’m assuming you all know how to get Reporting Services – http://www.microsoft.com/sql/reporting/default.asp - register for the beta. Lets look at how we are going to create our first Reporting Services Project. We are going to open VS 2003 and create a new Project. 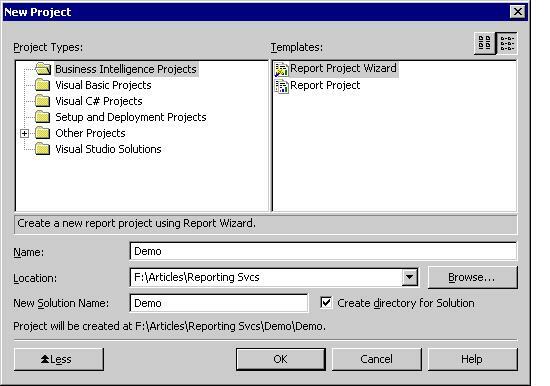 The project name is ‘Demo’, as is the solution name, and for the purpose of this example we are going to use the Report Project Wizard to create our first report. (Figure 1). As we can see in Figure 1, all this does is specify, that this is a ‘Business Intelligence Project’ – and that the name of the project and the solution is ‘Demo’. 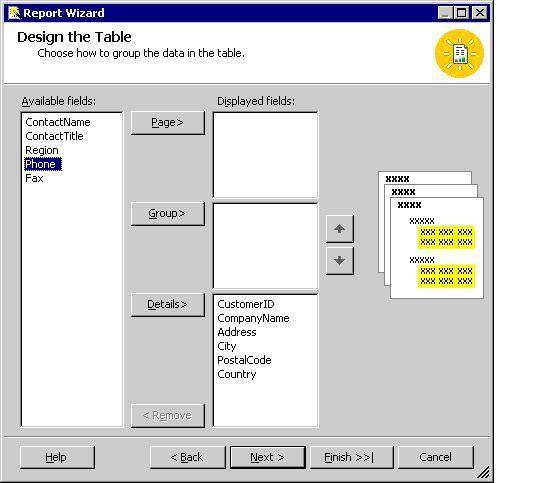 We specify the path where this is going to reside and that we are going to use the Report Project Wizard to build our first report. We are going to make our data source a shared data source. The data source ‘DemoDS’ is not going to be unique to the report ‘Customers’ that we are going to create later in this article however one which can be used by all reports in this project. It is stored as an xml file in the project (Figure 3). And choose a few fields we want to display in the detail section of this report. Again we are trying to keep this simple; hence we’re not going to use the ‘Page’ or ‘Group’ boxes for this sample. We go with the default location that we are prompted with by the Deployment Location Window. If you accepted the default when you were installing Reporting Services, your report server will be ReportServer too, otherwise it will be whatever you specified at install time. And now finally possibly less then 10 minutes after we started defining our first reporting services project and report (albeit a very simple one) we can click the ‘Finish’ button and are close to done. At this point we are officially done, just go to your web browser and type in ‘http://servrname/reports’ and you will see the project ‘Demo’ and if I drill down the report ‘Customers’. At this point we haven’t taken care of security, who has access to the reports, or programmed any complex reports, but the idea of this article was to show how easy it is to deploy a reporting application over the web. Till the advent of Reporting Services the delivery of Business reports, required coding of web pages, which took time and resources or buying 3rd party software – also expensive. With reporting services, the average business user can generate simple reports for themselves without requiring expensive IT resources.